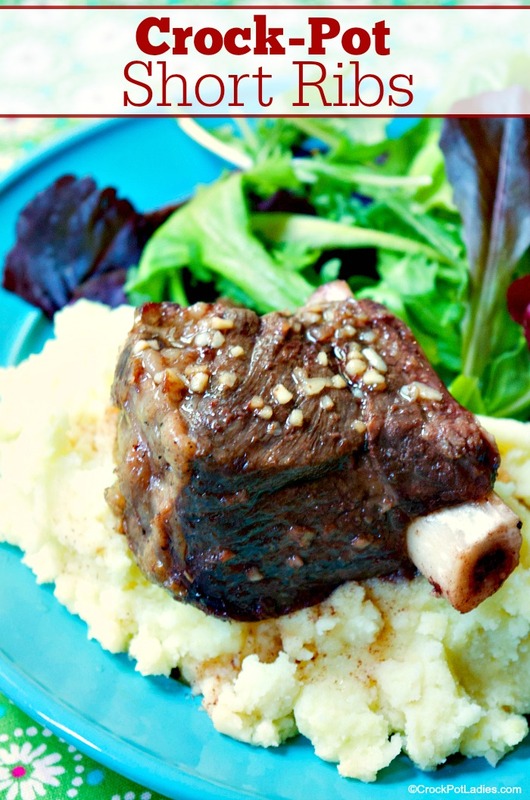 A handful of ingredients are needed for this delicious recipe for Crock-Pot Short Ribs. Red wine, brown sugar, olive oil, garlic, salt, pepper & beef ribs. I must admit, I LOVE read meat. Given the choice between a nice steak and some chicken breast I am going to pick the steak every single time. Steak is my #1 choice but short ribs are easily my close second choice. Recently on a date night dinner with my husband I ordered some delicious short ribs at the Gala Steakhouse & Bistro in Williamstown MA. Ever since that dinner I have been simply craving some short ribs. So, with my slow cooker standing by I decided to see if I could create a short rib recipe that would satisfy that craving. This short rib recipe is pretty simple and really can’t compare to those delicious ribs I had at the recipe. But my recipe still came out with some amazing flavor and looked nice too. The perfect dish to serve my family for a nice Sunday dinner. I served the short ribs over mashed yellow potatoes with some lovely steamed broccoli on the side. 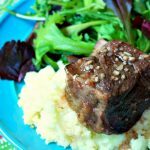 It really was a great meal and I plan on making these short ribs over and over again! A delicious way to prepare beef short ribs in the slow cooker. Simmered in red wine, olive oil, garlic and a little bit of brown sugar. Lightly sprinkle ribs with salt and pepper. Place ribs into a 5 quart or larger slow cooker. In a small bowl whisk together the red wine, olive oil and garlic with a fork until combined and pour over ribs. With a pot holders, carefully lift slow cooker insert from base and pour about half of the cooking liquid into a small saucepan. Place insert back into base and recover to keep ribs warm. Place saucepan on stove-top set to medium-high heat and add the brown sugar. Cook, stirring constantly until the sauce comes to a boil. Continue cooking about 3 to 5 minutes until the sauce thickens slightly. Being careful not the let the sauce boil over. Serve short ribs with sauce from saucepan spooned over. Slow cooking these in the slow cooker allows them to taste like braised short-ribs. Many recipes for short-ribs cooked this way call for browning them first. I rarely brown my meat before adding to the crock but you certainly can do that. If you like this recipe or find it useful, it would be lovely if you would consider leaving a nice 4 or 5 star rating. Rating is done by clicking on the stars above. VERY yummy! Did not do the brown sugar stuff, just left everything in the crock pot until we ate it. So tender & juicy. 5 stars from all 4 of us in the house!! !